Fergus Bisset took part in the inaugural Aberdeen Asset Management Scottish Par-3 Championship at the Paul Lawrie Golf Centre, Ardoe by Aberdeen and experienced a tremendous short course as well as a superbly run and great fun tournament. My home course, Banchory, features six par-3s of varying length and difficulty and it’s on those holes that a score is made, or more often for most, lost. All too frequently I walk off after a competitive round rueing my performance on the short holes. I’m ok if I hit the green but my short game is pretty appalling and, if my tee shot drifts even a foot off the putting surface, beads of sweat appear on my brow and my hands start shaking. No, par-3s are not my strongest suit. My excitement was then, tinged with a little trepidation when I eagerly accepted an invitation from Paul Lawrie and Visit Scotland to take part in the inaugural Scottish Par-3 Championship at the Paul Lawrie Golf Centre, Ardoe, just on the outskirts of Aberdeen. I saw it was a pro-am event and I immediately began to feel very sorry for the professional who would have to watch me duff, thin and shank my way around the nine-hole layout. I headed straight into the back garden for some intensive chipping practice. Having invested more time than I really had to spare and turned my lawn into one big divot, I felt I had found something resembling a chipping action and was a little more confident as I drove towards Aberdeen and the Paul Lawrie Centre on the south bank of the River Dee at Ardoe for day one of the championship this Monday. The first thing to say is what a tremendous facility Paul and his team have created here. From first welcome in the superbly stocked shop, the service is of the very highest standard and the attention to detail is exceptional. The driving range features large bays, clear targets and wall mirrors to check your set-up and swing. Tuition is available in dedicated private bays from some of Scotland’s finest coaches: Andrew Locke, Billy Fyfe and Alan Stuart, and custom-fitting is on offer too. It’s all very impressive and that’s before you get to the brilliant Clarets Coffee Shop, walking past a selection of pictures featuring highlights from Paul’s career on the way. During the tournament, I heard a great deal of praise from the players for the set-up at Ardoe. These guys travel across the country and overseas, experiencing a huge number of different facilities of this type and, by all accounts, the Paul Lawrie Golf Centre is one of the best out there. The excellent par-3 course at the Centre was also received very positively. Designed by Graham Webster, it’s 2,672 yards with holes measuring between 103 and 182 yards. This is no pitch-and-putt, it’s a proper golf course. Presented in exceptional condition, the tees, testing green complexes and bunkering are of a very high standard and the layout demands a great variety of shots and skills. It’s hard to believe that, in the floods of early 2016, the course and the driving range here were under water and required extensive renovation work. That work has been completed so well as to leave the Centre in a far better position than before the flood waters came. As such, this was the ideal time to hold an event like this to showcase what’s on offer at the Centre. Paul and team do a top-class job in promoting and supporting golf in Scotland and the number and quality of sponsors at this event provided evidence of this. Title sponsor was Aberdeen Asset Management and a selection of local and national firms lent their support as this picture confirms. There were some fairly decent prizes on offer too – Farmfoods were offering hole-in-one prizes, two of £5,000 and one of £10,000 and Morrison Motors had put up a £25,000 Mercedes for a hole-in-one at the 5th. Despite all of our best efforts, they went unclaimed. With great sponsors, a respected Major winner as the host and an excellent course to compete over, it wasn’t surprising that the event attracted a strong field. There were two Major champions on the start sheet – 1999 Open Champion Paul Lawrie of course, and 2005 US Open winner Michael Campbell from New Zealand. European Tour winners Scott Jamieson, Alastair Forsyth and Miguel Angel Martin teed it up, as did Peter Whiteford, 2014 Amateur champion Bradley Neil and two-time Scottish Amateur champion David Law. I was playing with Tartan Tour star Chris Currie. Attached to Caldwell Golf Club in Renfrewshire, he’s been one of the most successful players on the Scottish domestic circuit in recent years. Chris was runner-up in this year’s Titleist and FootJoy PGA Professional Championship at Luttrellstown Castle in Ireland and will represent GB&I against the USA in the PGA Cup this September. After a rather splendid bacon roll in Clarets, some self-conscious chipping and some banter with Chris and our playing partners – professional Philip McLean and amateur Alan Duncan – it was time to let battle commence. 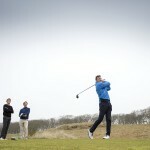 Being announced onto the tee is always daunting for amateur golfers but on this occasion, the nerves were heightened by two extra factors – Firstly the wind was hard against and I couldn’t see any way of forcing my iron shot onto the narrow green, secondly; we were being watched by tournament host and former Open champion Paul Lawrie. The fact I even got the ball airborne heading vaguely forwards was enough for me. That it ended 20 yards right of the green in very thick rough was of secondary concern. There were two competitions running in the Scottish Par-3 champs – An individual professional event, lowest scratch over 36 holes and a pro-am event in which the best score of the two was to count on each hole. Receiving three shots per 18 holes, I wasn’t sure I’d be of much use to my pro. But actually, that’s one of the great things about having a pro-am on a par-3 course. Even a blind squirrel occasionally finds a nut and on each tee you have a chance; just one good shot can see you contribute something. It made this a fun format for amateurs of all handicaps and I would imagine that all those competing were able to contribute on a good few occasions. Day one was contested in extremely blustery conditions that made this excellent par-3 course highly testing. Into the wind, anything slightly mis-struck or with a hint of side spin had no chance of finding the target and downwind it was very tough to judge the distance. Evidence of what a great test of golf this short track delivers came from the fact that, over the course of two laps on day one, I used every iron in my bag, from a punched 3 into the draft on the 182-yard 8th to a sand wedge on the short 7th with the wind whipping behind. Former European Tour star Alastair Forsyth led the way after round one, having posted an excellent round of 5-under-par: very impressive in the conditions. Day two saw more benign conditions and Chris and I managed to better our first round score of 3-under with a respectable 6-under 48. Neither of us had much luck with the putter but I was happy to finish strongly – Chris holed a beauty for a two from just off the green on the 18th. Our second round playing partners, EuroPro Tour player John Henry and Deeside GC member Keith Ingram were not only excellent company on the day but they also provided some fireworks to entertain us. On a three hole stretch on the first loop Keith posted scores of 2, 2, nett 1! Their front nine was completed in just 21 shots. After we’d finished Chris and I chatted over lunch about how much we’d enjoyed the two days at Ardoe. The professional tournament reached an exciting conclusion with a playoff between overnight leader Alastair Forsyth and young Louis Gaughan from Bathgate after both men finished on four-under-par. It was the less-experienced player who prevailed with a superb shot to the first extra hole. Gaughan fired an 8-iron to within two feet of the cup at the 160-yard 9th to secure a two and the title. “All the players have said they didn’t realise we had a proper golf course here and not a pitch and putt – and that’s what we wanted to achieve this week,” he said. I for one was highly impressed both with the course and with the event itself and would love to see it repeated next season. The aim is to move the date to coincide with the US Open, thereby attracting more European Tour players to compete. When word gets back about what a fun tournament this is; something a little different, superbly organised but with a relaxed feel, I’m sure the event will go from strength to strength over the coming years.